Historical subjects need illustrations just like any other subjects. I was looking at the word "front" and I learned that for the Russian military it has a specific meaning. I looked up the corresponding article and found this picture. 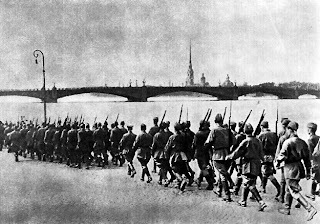 It shows soldiers marching, a bridge and a tower in the background. It is probably the best picture that we have and it will be replaced once we have a better version of this photo or when we have an alternative. The question is where do we get a better alternative. Who has access to the original picture and can create a quality scan. There are likely enough alternatives to this picture.Who can help us improve our illustrations of this article ?